For the last few weeks, @wastingcoffee on Instagram (started by Umeko Motoyoshi) has posted photo after photo of beautiful - but cringeworthingly wasteful - cups of coffee: action shots of flying cappuccino streams, latte art mid-dump, drip coffee face showers, and even a shattering Chemex. Through the photos and tongue-in-cheek captions, Umeko has sparked conversation about the incongruence of such pictures in an industry that usually prides itself on sustainability and value throughout every step of the coffee chain. Click on the @wastingcoffee Stories or Highlights, and you’ll see copies of direct messages that Umeko has received from dozens of baristas and shop owners, openly confessing to similar acts of waste as seen in the photos. The conversations almost always take a hopeful turn, as those same coffee professionals suggest how they and others can do better - giving ideas for better practices in dialing in espresso, reusing old brewed coffee, and what to do with the innumerous drinks made just to photograph the latte art on top. Part of the conversation is around latte art throwdowns. The Thursday Night Throwdown concept was pioneered in Atlanta in 2008 by Ben Helfen (a weekend Taproom barista when we opened five years ago!) and spread worldwide, and now seems like a staple in the specialty coffee community. We’ve hosted many TNTs at Taproom, and every time we’ve dumped perfectly drinkable cappuccinos down the drain. A few do get consumed, but as the competitions are always in the evening, most people don’t want the caffeine closer to bedtime. In a 24-person single-elimination latte art tournament, we’re using at least 24 double shots of espresso and two gallons of milk. The drinks are made to the same specifications as the cappuccinos sold to customers off the menu, yet these particular cups are crafted, looked at for a few seconds, pointed to, and then poured out without ever touching someone’s lips. So can we do better? Yes. Focusing just on latte art competitions, there are lots of ideas for what to do differently so that all that high-quality, not-so-cheap specialty coffee and organic milk doesn’t end up immediately poured out in the sink. It’s easy to offer those cappuccinos for a dollar each, simply give them away to be drunk, or use decaf espresso shots so that people will want to drink them. Hot chocolates instead of cappuccinos, to bring the coffee waste down to ZERO. More people would be willing to drink hot chocolate instead of coffee drinks in the evening. Adjust the usual event time to earlier, so that more families/kids could attend (and more hot cocoa would be consumed). Offer the hot chocolates for free. It doesn’t make sense for us to charge someone for rescuing a beverage that would have just been thrown away. Encourage attendees to bring their own mugs if they want a hot chocolate. We usually run out of ceramic cappuccino cups during the competition, and transferring completed drinks to paper cups for consumption just contributes to another type of avoidable waste. Use milk pitchers that have fill lines to reduce milk waste during steaming - We’ll be using Slow Pour pitchers. You can still have latte art in hot chocolates without the espresso - there’s very little difference in barista technique and in the final appearance of the drinks. So please join us for this event, and bring a mug to enjoy one of the hot chocolates that get made. It’s Wednesday, April 17th at Taproom. Competitor signups will open at 6pm, and pouring will start at 6:30pm. Coincidentally, Earth Day happens to be the following Monday, April 22nd. I realize, of course, that there are a lot of things our small company could change or start doing to promote sustainability and taking care of God’s creation. This event is admittedly a tiny step in raising awareness and accomplishing a (fairly negligible) practical difference, but it is still a part of a larger ongoing conversation and effort to be more environmentally and fiscally conscientious. UPDATE: Our fundraiser went well! We sold enough bags to donate $700 to Kirkwood Cares for the project! We (Taproom) came to the Kirkwood neighborhood of Atlanta four and a half years ago. Over that short time we've seen a lot of changes take place around us - businesses have opened and thrived in previously-vacant buildings, new residential and commercial developments have popped up, streets occasionally get blocked off because of movie filming, house prices have skyrocketed, and there is an ever-developing sense of what it means to be Kirkwoodian. We want to take an active role in the betterment of our community - realizing that "community" means different things to different people. We all have our individual personal histories, our affinity groups, our feeling of belonging or not. And the complex intangible stuff sometimes meets the fairly simple tangible realities - we pass each other on the street, our kids play with each other on the playground, we're around enough that we notice when the other has a visible need. As a family-owned business, there are small ways we can leverage our resources so that we're more than just a physical presence and really live out being true neighbors in our neighborhood. There's a great story of a pretty wise man who told a parable and asked a guy "Which of these three, do you think, really proved to be a neighbor?" I want to be like the third guy, in my personal life and with my business. All that may be a little hokey for an explanation of participating in a fundraiser, but I try to live life on purpose, and to even have Taproom function like that in all areas. So, yes, we're doing a little fundraising project for our neighborhood. Kirkwood Cares was launched this past year, and in just a few months they've helped out some of our neighbors with critical repairs to their homes: They've provided funds and labor to replace water heaters, repair a sewer pipe, replace a roof, repair soffits, build a new deck, paint, make electrical repairs, and more. The donations and volunteer labor coming from individuals and businesses have been incredibly inspiring! 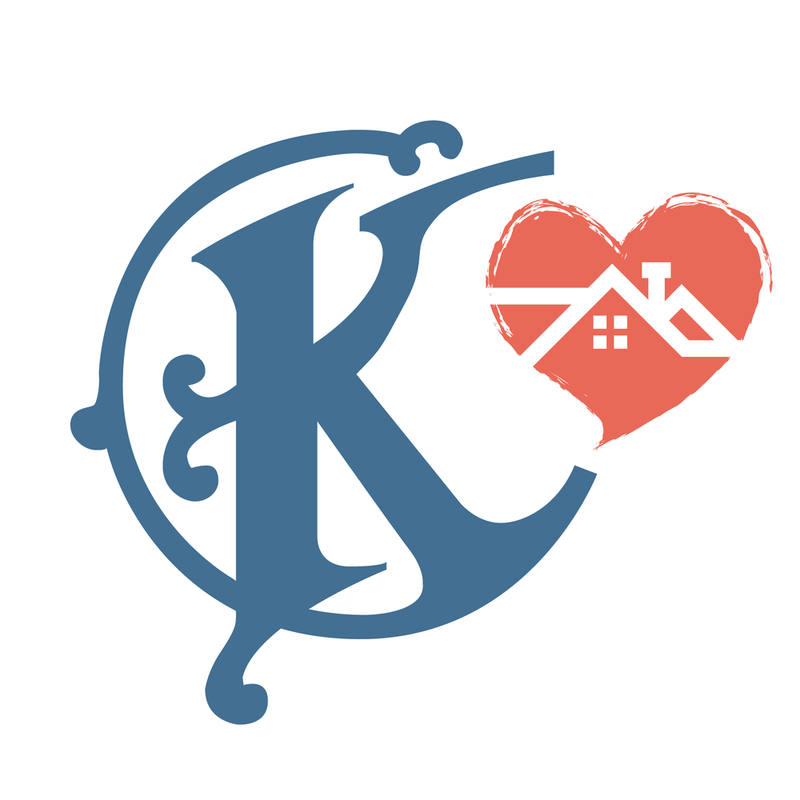 For our fundraiser, we're keeping it simple: Fund one neighborhood project through Kirkwood Cares. We want to fully pay for replacing rotten floors for Miss Deborah over on Warren St. NE. To do that, we're doing what we do best... selling coffee. When we started Taproom in April 2014, Jared Karr was one of eight baristas on the opening crew. Jared had been a barista for just a short time, but knew he wanted to be in the coffee industry for the long haul. In his initial interview - while sitting in our half-finished space next to construction rubble - Jared was honest with me about his desire to open his own roastery, and that he wanted to gain as much knowledge and experience as possible wherever he worked in the meantime. 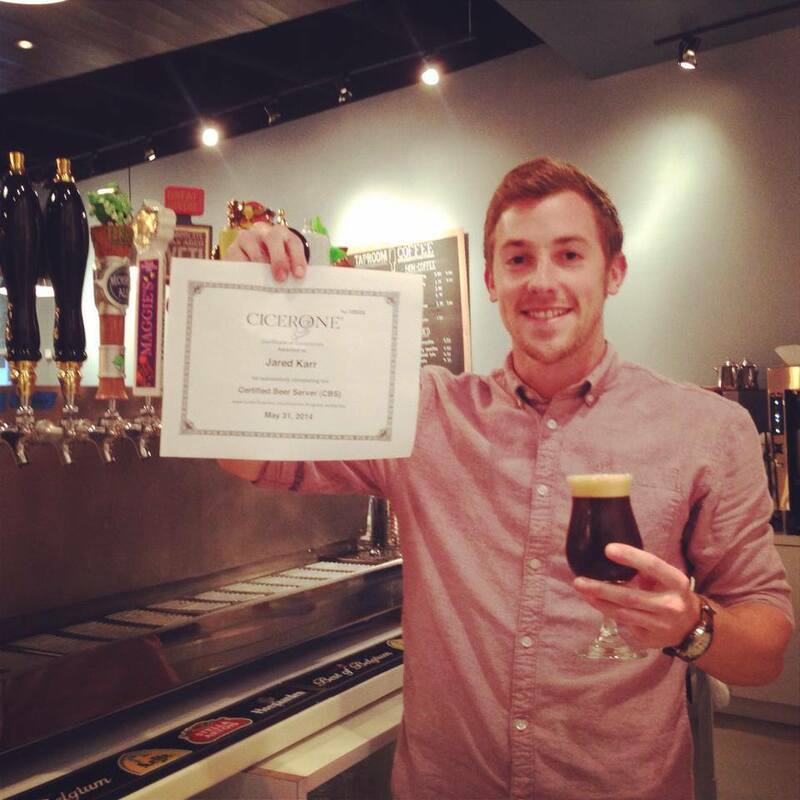 A baby-faced Jared, when he obtained his Cicerone Certified Beer Server certificate in 2014. I took a shot on Jared and hired him, aware that it would only be a matter of time before he would resign and head off to do his own thing. I know I could have viewed hiring Jared as a waste of time, or even as shooting myself in the foot, if he were to eventually become competition for me in the Atlanta coffee scene. Over the course of a couple years, Jared and I would have many shifts together - tasting hundreds of espresso shots and learning about extraction, discussing all the joys and challenges of small business ownership, and delighting in the occasional prank (ask him about how he got me to believe all my full-time staff was quitting on me, or how he realized a spent espresso puck looks like a brownie but doesn't taste like one). Jared and I also became good friends over time. We attend church together, he helped me build my deck at my house, he's babysat my kids, and my wife and I even did his premarital counseling. It's not every day that people successfully bridge the gap between personal and business, but we seemed to healthily navigate that dynamic throughout Jared's tenure at Taproom. With what seemed like minimal input from my side, Jared grew in experience and made steady progress in growing his coffee business from a dream to reality. He went from roasting coffee in a WhirleyPop, to roasting on my own dinky home coffee roasting machine, to graduating to a small commercial coffee roaster and securing his first regular accounts. When the time came to make East Pole Coffee Co. official, it was no surprise to anyone that Jared was on track for success. Jared turned in his resignation when East Pole was growing from side project to sustainable main gig. It didn't take much for us to realize a Taproom-East Pole partnership made complete sense, and in March 2017 we announced the switch to using East Pole for our core coffee menu. When Jared was recently recognized as an Atlanta Rising Star by StarChefs, I got to publicly share a few words at the honorees dinner as Jared's mentor. Personally, I don't claim the title "mentor" with Jared - I'd rather not view our relationship with that measure of formality. We're friends and brothers in the journey, not mentor-mentee. I continue to cheer on Jared and East Pole in their glowing success in the local and national coffee scene. Last week, Food & Wine listed the "Best Coffee in Every State" and I smiled as I saw East Pole named as Georgia's top coffee company, with not a whisper of mention for Taproom. I predict that it'll happen over and over for years to come. It is an honor and privilege to be a part of Jared's life and career! If you want to celebrate East Pole's success with Jared and hundreds of other people, attend their annual "From Atlanta" party, April 6th at 7pm the East Pole roastery & bar location. You can also say hi to Jared and co. at Taproom's 4th anniversary bash on April 26th. The food and travel guide The Southern Weekend dropped by last week to find out what Beerspresso is all about, and to ask how we help people connect over coffee and beer. This might be one of the best videos we've had featuring Taproom! November is National Adoption Month. This doesn't really have anything to do with coffee, but it has everything to do with this specific coffee shop owner. Pictured above are my four precious kids. My wife and I are typically over-sharers, and I hope my kids forgive me one day for plastering their pictures all over Instagram and Facebook. It's not that my wife and I crave attention and public affirmation but, rather, we're always super excited to share the individual moments that bring us joy - and that often centers hugely around our family and kids. We also know that even the "look" of our family is a kind of lesson to us as a society: Connection, love, family... those things are defined and established by way more than the color of your skin or what family situation you're born into. We dub ourselves a "rainbow family", with me being Filipino, my wife is white American, and we have our mixed kids and our African-born kids. So I know that we can't help but stand out with our unique look... and I know that with that, we have opportunity to share our story and be advocates for adoption and for rethinking what truly makes a family. The short story: My wife and I adopted twin girls from Uganda in 2012. During the long months when we fumbled through the process of learning how to be a family together, I also started the journey of becoming a coffee shop owner. We went from 1 kid to 4 in the span of 13 months. The business was my 5th baby. The long story? Catch me in the shop sometime and just ask me in person. Taproom has grown up with my kids. Check out the Instagram feed and you'll notice the occasional cameo of a little Pascual. I keep family and business separate for the most part (with healthy work-life balance) but those worlds do intersect and interact in many ways. One of our customers who comes in every day regularly jokes about her daily habit: "Gotta help put Jonathan's kids through college." And that's kinda true... because I'm the sole owner of the company, you buy a cup of coffee and my kids benefit from it. One of the big struggles my wife and I had in the adoption process was that we didn't actually know anyone who had previously adopted. At the time, none of our close friends or family had any experience with adoption. So, part of this post is to let you know: You know someone. If you're considering adopting, or if you've recently adopted, or if you even just want to explore that whole world for the first time... reach out and we can chat. According to AdoptUSKids, there are approximately 400,000 kids in the US foster care system, with about 100,000 of those kids waiting to be adopted. Worldwide, UNICEF estimated in that in 2015 there were 140 million orphans worldwide. It's hard to wrap your mind around those kinds of numbers... every year there are about 20,000 domestic infant adoptions, about 50,000 adoptions from within the U.S. foster system, and about 5,000 international adoptions by Americans (see references here and here). I don't have a ton of practical action points for you. Really I just wanted to be another voice joining the chorus to raise awareness about adoption. From experience I know that one of the biggest hangups in getting involved is just starting the conversation. So consider it started for you. A bunch of kids out there need families. There are lots of ways to get involved, from being a voice raising awareness, to supporting adoptive families, to the very possible scenario of you taking in one of those kids and being a forever home. Wherever you find yourself in the process, please feel free to contact me or pull me aside in person to chat. We can share a cup of coffee and talk adoption. We're super excited that the new location for our partnering roaster East Pole Coffee Co. is now open!!! They had their soft launch this morning, and will be doing a grand opening next week. Check them out Monday-Friday 7am-3pm and Saturday-Sunday 8am-2pm. The store is located in the Armour Yards development, where ASW Distillery and SweetWater Brewery are located. Jared Karr, one of the owners of East Pole, was a Taproom barista on day one back in April 2014. Now at the helm of arguably the best new specialty coffee roasting company in Atlanta, Jared and his team will use their new roastery location to keep churning out the core coffee offerings at Taproom, and their new bar is where our crew will get hands-on barista training! 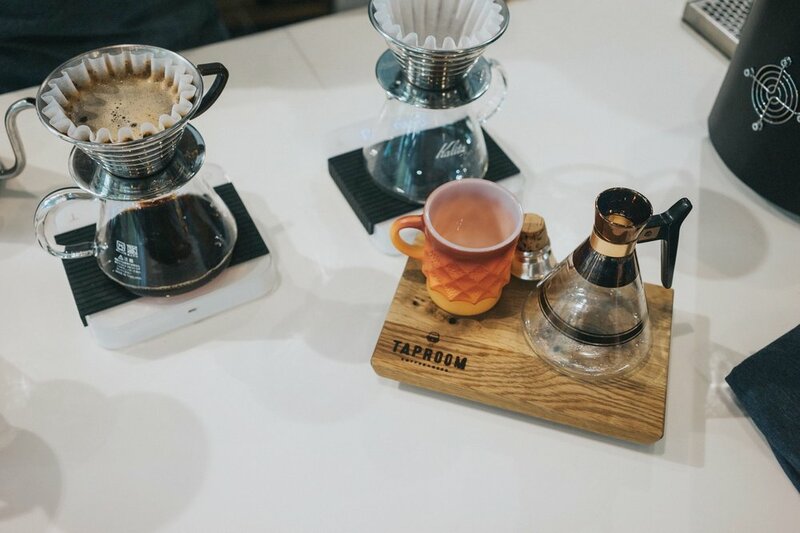 While we often hire experienced baristas and quickly take all new staff through the Taproom ways of brewing and presenting great coffee, we simply aren't set up for an in-depth, hands-on coffee training program like what we previously got through Counter Culture Coffee. 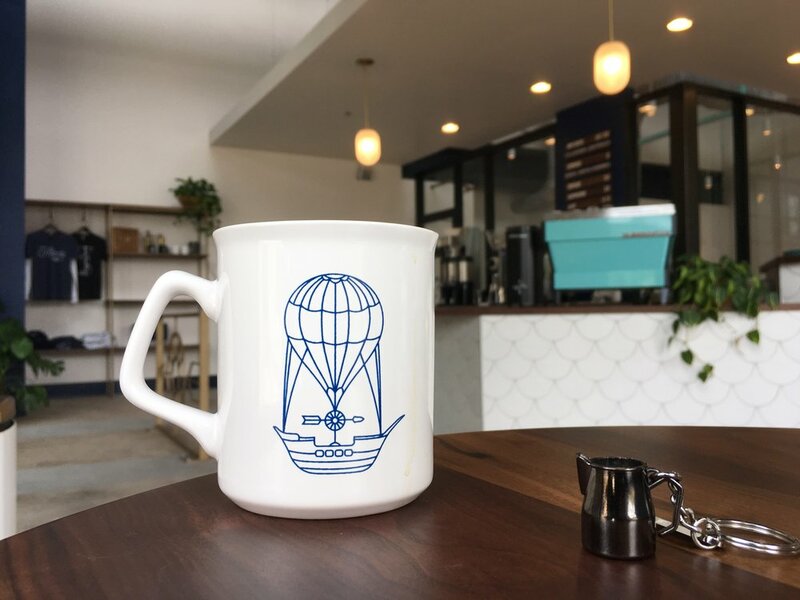 Now, with East Pole's new location, they intentionally shut down their bar to regular service every afternoon, so that our staff and other accounts get the chance to receive individualized barista training. 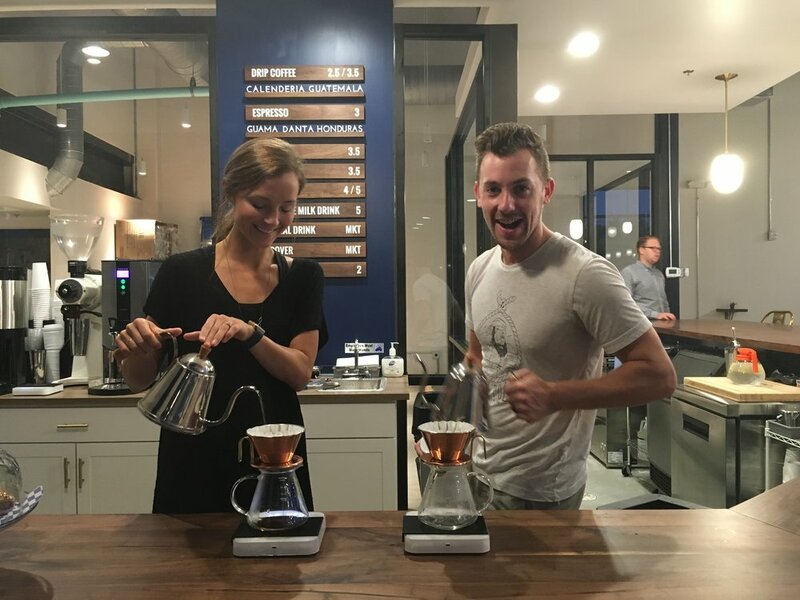 Specific training sessions will cover coffee brewing science, manual pourover technique, bar flow management, espresso technique, palate development, customer service and more. And for Taproom staff, I've always incentivized professional development - whenever our baristas complete the East Pole training program and pass a practical exam behind our own bar, they'll receive a permanent wage increase. Better training means more consistent quality and experience for you when you come into Taproom! If you've had a cup of coffee at Taproom, you've taken sips out of a vintage Fire-King coffee mug. So what's the whole deal with those things? I have to give sole credit of the idea to David Lamont, previously with Counter Culture Coffee and now with La Marzocco. 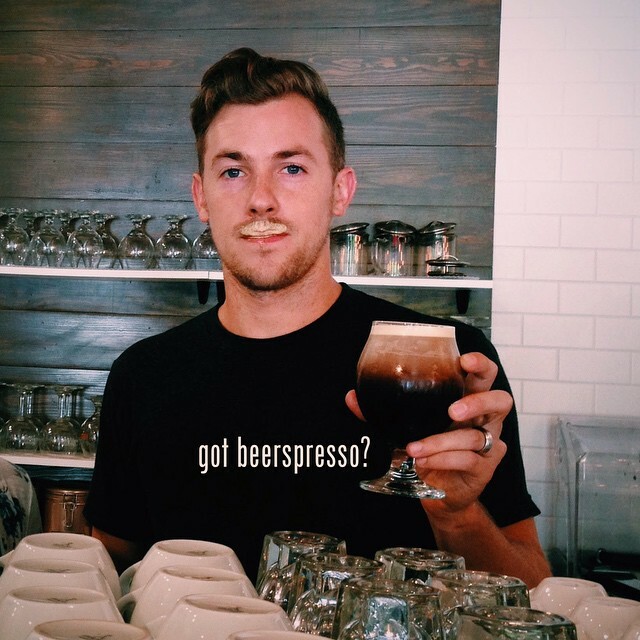 (Fun fact: we also have David to thank for coining the term "Beerspresso".) Maybe ten years ago, David introduced me to this fun line of serveware that many people can recognize from their grandparents' kitchens. He said off-handedly at some point that it would be cool to have a coffee bar that served regular coffee out of them. Anchor Hocking (the glassware company) produced a line of serveware called Fire-King, from the '40s through the '70s. They had mugs, bowls, plates and other dishware in the collection, and are often distinctive for the white "milk glass" that they're made out of (think Pyrex). We've used and sold all styles of Fire-King mugs, but have settled mostly on the stackable ones, with a preference for the Kimberly Diamond design. I doubt that these mugs were ever intended for high-volume coffee shop use. They chip and crack as easy as any other glassware. They're not super easy to find, even in antique stores, and I've only ever found one at a Goodwill. We get all ours from eBay, and it's only affordable because we bid on the huge 30-piece lots that no one else wants. So why do we use them if they're a lot of trouble to find and we constantly have to replace them? Well... they're fun to drink out of. We're proud of the coffee we serve, and it makes sense to have the quality and uniqueness of the beverage matched by that of the vessel it gets served in. If you go to Grandma's house and she hands you one of these mugs, you get a smile on your face and you just feel... special. That's the kind of experience we're going for at Taproom. On your next visit, ask for a regular ol' drip coffee or a manual pourover brewed to order - by default, either one is always served in a Fire-King mug. We don't publicly advertise it much, but at any time you could also purchase any of our mugs if you want to take one home for good. We've actually unknowingly sold some rare pieces that are worth $50-$100 each! And if you're clearing out Grandma's storage and happen upon a jackpot collection of these mugs and need someone to take them off your hands, let us know! I've been a barista for a little over ten years now. That's ten years of the same motions, day after day: pulling, pushing, twisting, standing, squatting, lifting, shaking. In addition to building up a virtual immunity to liquid burns, I know that I've probably submitted myself to an elevated risk of repetitive motion injury. Lots of baristas can probably empathize with me when I confess: My wrist hurts. I'm behind the espresso machine a lot less nowadays (thanks to my incredible crew), but whenever I pull 8 hours behind the bar, I feel the pain, numbness, or throbbing in my right wrist almost immediately, and usually some time after that for at least the next few days. I've toyed around with ergonomics. I've changed body positioning with tamping, locking in portafilters, etc. I've read articles and watched videos, paid attention to my movements and done stretches. But through it all I haven't been able to shake the recurring pain. There have been articles about this issue for baristas, reported by Sprudge, Fresh Cup, even the New York Post. 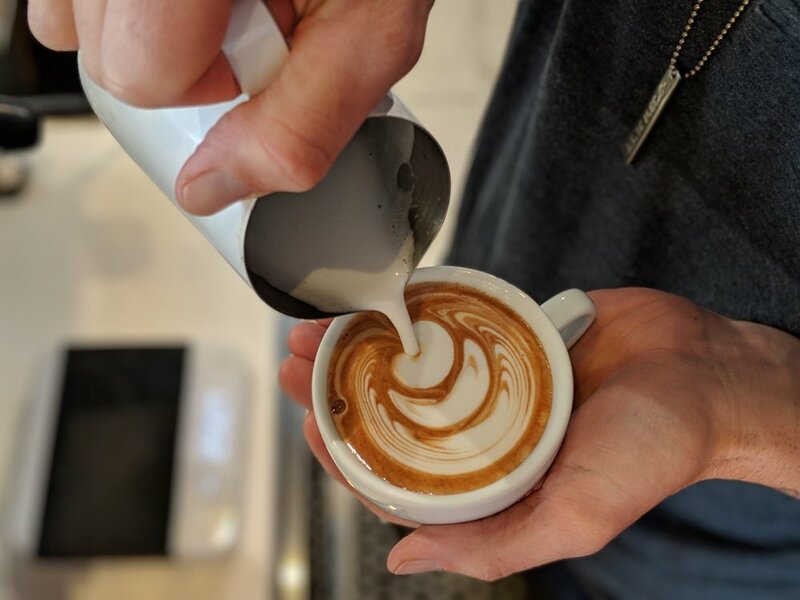 Most people who investigate barista injury point out that the act of tamping is probably one of the key culprits, so some companies have tried to be innovative in tamper design to try to reduce the likelihood of tamping-related strain and injury. Last year we purchased a first-edition PUSH tamper, which quickly became my go-to tamping device. But even though my motions and wrist felt better overall, I'd still have nagging pain every now and then. After a recent conversation with some of my staff, I realized almost every one of us experienced wrist pain, but we just didn't talk about it a lot. So when the Puqpress started being distributed in the United States, I contemplated investing in one for the sake of barista health. We got our Puqpress yesterday. It's only been less than 24 hours, but I have to admit I'm super pleased with it so far. The machine tamps the coffee grounds quickly, evenly, and without any significant wrist/arm movement needed. The true test will come over the next few months to see if wrist pain gets better or stays the same. Either way, one added benefit to the Puqpress is that our overall espresso consistency is improved - tamping variance is less of a factor in producing great-tasting shots of espresso. New Hours: Now Open Earlier! We've adjusted our hours slightly to accommodate earlier morning coffee runs!